Horst Hanschur, Head of Sales Strategy and Business Development: "Completely new approach to experiencing the car, its ecosystem and its technologies." Ingolstadt, January 24, 2019 – The all-electric Audie-tron has landed at Munich Airport in a multi-storey meteorite that covers a 630-square-metre site ahead of its official launch on the German market. Until mid-March, visitors and passengers can experience the new model for themselves along with its technology, its service ecosystem and other exciting future projects from Audi in the MAC Forum between Terminal 1 and Terminal 2. "We are starting a new chapter for our brand with the Audi e-tron. The focus – aside from the new car – will for the first time be on new digital services and on charging," said Horst Hanschur, Head of Sales Strategy and Business Development at AUDI AG. "Our meteorite therefore also offers a completely new approach to experiencing the ecosystem and technologies surrounding our first all-electric, high-volume model. But our approach goes even further: This year we will be working together with Munich Airport to develop a complete infrastructure for electric charging." From technical issues like charging or recuperation to the driving experience in an Audi e-tron – the meteorite offers a comprehensive overview of electric mobility and how the company envisions the electric future. Kids have fun on their own expedition through the meteorite while discovering the electric world of Audi with a small, animated robot called ADUI. Audi also makes it possible for prospective buyers to take a short test drive in the e-tron from the meteorite in the MAC Forum without prior registration. A free one-hour driving experience can be booked through your Audi partner in advance. The meteorite will also be used during central launch training for the Audi e-tron for the worldwide sales organisation. More than 9500 dealership employees from all over the world will learn about the technology and the entire Audi e-tron ecosystem in detail. 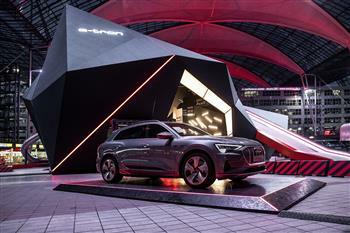 Another part of the e-tron experience at Munich Airport until March is an escape room within the directly adjacent myAudi Sphere. Visitors can learn about the technology of the new electric Audi here while having fun playing through multiple scenarios. When all of the puzzles have been solved, the reward is a test drive. In addition, Audi is building one of the world's largest charging station systems at the Munich Airport in 2019, with more than 70 AC charging points (22kW) and six DC charging points (150kW) created at the site. The all-electric Audie-tron has landed at Munich Airport in a multi-storey meteorite that covers a 630-square-metre site ahead of its official launch on the German market.